There are many great museums along the Mall of Washington DC. The Air and Space Museum is one to glide through slowly. The Udvar Hazy Museum is a companion facility. It’s a short drive over the State line into Chantilly Virginia. 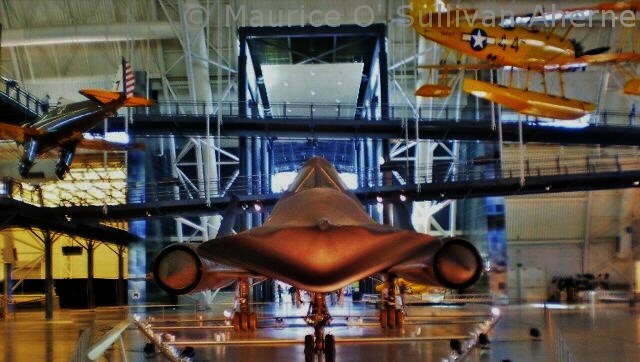 SR7I looking more like a caged cat in a museum than a Mach 3 Super Machine. 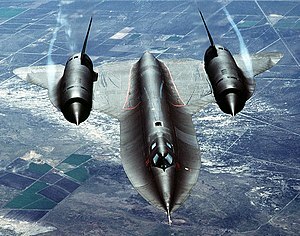 The SR-71 was polished and shining like a new large toy. It’s pristine look betrayed the operational wear it had to sustain during it’s service. Even before it was consigned to this museum, it was set a task- to fly from California to DC- in record time. Incidentally, the room in the background (above) at the time I was there ca 2007 -housed the drop test STS Shuttle Enterprise *. This has been replaced at this museum by STS Discovery post-Operational Service. The engineless Enterprise has moved to New York on the Hudson aboard the Intrepid floating carrier museum beside 12th Avenue. Another 71 is a stationary star in Merced California. It’s retirement home is a titanium preserving sun-baked plot at Castle AFB 5050 Santa Fe Drive, Atwater, California, 95301, in the San Joaquin Valley, one hour from Fresno, two hours from Sacramento, and three hours from San Francisco. Castle AFB is itself decommissioned. It was the home base of B47’S and B 52’s since the 1950’s. Less than two decades earlier this aircraft was flying 2000mph at almost triple the altitude of regular commercial flight. The classified figures are even more impressive I suspect. 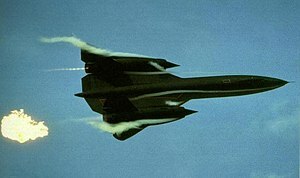 This bird was the most operational SR-71 and even from Santa Fe Drive, it had the subtle allure of a raven-haired woman in a well cut-dress. I emphasise that it is the aesthetics of aircraft, and the skill of crew (here and elsewhere) that I commend. The politics are another thing! 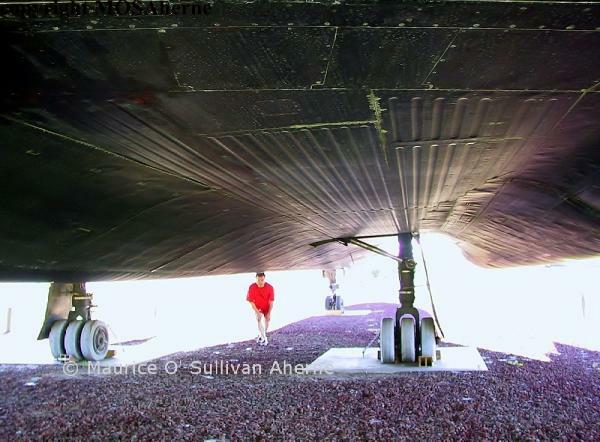 Incidentally residual pride in ‘Irishness’ is rekindled by knowing that some of the elite crew who were involved with this great airframe were connected to the ‘ol sod’. Pat Halloran was one of a few , and moreover had command of the Wing, at a time when classified assignments were at their height. Here is the SR 71-roster. Check the paternal names here. As is the case elsewhere in the USA, the maternal lineage might provide as much connection with others. Copyright © 1996 Leland R. Haynes. There were a lot of things we couldn’t do in an SR-71, but we were the fastest guys on the block and loved reminding our fellow aviators of this fact. People often asked us if, because of this fact, it was fun to fly the jet. Fun would not be the first word I would use to describe flying this plane—intense, maybe, even cerebral. But there was one day in our Sled experience when we would have to say that it was pure fun to be the fastest guys out there, at least for a moment. I was beginning to feel a bit sorry for Walter in the back seat. There he was, with no really good view of the incredible sights before us, tasked with monitoring four different radios. This was good practice for him for when we began flying real missions, when a priority transmission from headquarters could be vital. It had been difficult, too, for me to relinquish control of the radios, as during my entire flying career I had controlled my own transmissions. But it was part of the division of duties in this plane and I had adjusted to it. I still insisted on talking on the radio while we were on the ground, however. Walt was so good at many things, but he couldn’t match my expertise at sounding smooth on the radios, a skill that had been honed sharply with years in fighter squadrons where the slightest radio miscue was grounds for beheading. He understood that and allowed me that luxury. Just to get a sense of what Walt had to contend with, I pulled the radio toggle switches and monitored the frequencies along with him. The predominant radio chatter was from Los Angeles Center, far below us, controlling daily traffic in their sector. While they had us on their scope (albeit briefly), we were in uncontrolled airspace and normally would not talk to them unless we needed to descend into their airspace. We listened as the shaky voice of a lone Cessna pilot who asked Center for a read-out of his ground speed. Center replied: “November Charlie 175, I’m showing you at ninety knots on the ground.” Now the thing to understand about Center controllers, was that whether they were talking to a rookie pilot in a Cessna, or to Air Force One, they always spoke in the exact same, calm, deep, professional tone that made one feel important. I referred to it as the “Houston Center voice.” I have always felt that after years of seeing documentaries on this country’s space program and listening to the calm and distinct voice of the Houston controllers, that all other controllers since then wanted to sound like that and that they basically did. And it didn’t matter what sector of the country we would be flying in, it always seemed like the same guy was talking. Over the years that tone of voice had become somewhat of a comforting sound to pilots everywhere. Conversely, over the years, pilots always wanted to ensure that, when transmitting, they sounded like Chuck Yeager, or at least like John Wayne. Better to die than sound bad on the radios. Just moments after the Cessna’s inquiry, a Twin Beech piped up on frequency, in a rather superior tone, asking for his ground speed in Beech. “I have you at one hundred and twenty-five knots of ground speed.” Boy, I thought, the Beechcraft really must think he is dazzling his Cessna brethren. Then out of the blue, a navy F-18 pilot out of NAS Lemoore came up on frequency. You knew right away it was a Navy jock because he sounded very cool on the radios. “Center, Dusty 52 ground speed check.” Before Center could reply, I’m thinking to myself, hey, Dusty 52 has a ground speed indicator in that million-dollar cockpit, so why is he asking Center for a read-out? Then I got it, ol’ Dusty here is making sure that every bug smasher from Mount Whitney to the Mojave knows what true speed is. He’s the fastest dude in the valley today, and he just wants everyone to know how much fun he is having in his new Hornet. And the reply, always with that same, calm, voice, with more distinct alliteration than emotion: “Dusty 52, Center, we have you at 620 on the ground.” And I thought to myself, is this a ripe situation, or what? As my hand instinctively reached for the mic button, I had to remind myself that Walt was in control of the radios. Still, I thought, it must be done—in mere seconds we’ll be out of the sector and the opportunity will be lost. That Hornet must die, and die now. I thought about all of our Sim training and how important it was that we developed well as a crew and knew that to jump in on the radios now would destroy the integrity of all that we had worked toward becoming. I was torn. Somewhere, 13 miles above Arizona, there was a pilot screaming inside his space helmet. Then, I heard it—the click of the mic button from the back seat. That was the very moment that I knew Walter and I had become a crew. Very professionally, and with no emotion, Walter spoke: “Los Angeles Center, Aspen 20, can you give us a ground speed check?” There was no hesitation, and the replay came as if was an everyday request. For a moment Walter was a god. And we finally heard a little crack in the armor of the Houston Center voice, when L.A. came back with, “Roger that Aspen. Your equipment is probably more accurate than ours. You boys have a good one.” It all had lasted for just moments, but in that short, memorable sprint across the southwest, the Navy had been flamed, all mortal airplanes on freq were forced to bow before the King of Speed, and more importantly, Walter and I had crossed the threshold of being a crew. A fine day’s work. We never heard another transmission on that frequency all the way to the coast. This entry was posted in NOT ONLY, BUT ALSO..... and tagged aviation, SR71. Bookmark the permalink.